You’re obviously a movie junkie? Absolutely. I would like to think of myself as someone who perpetually lives in the world of movies. I prefer recent or new releases—As Good As It Gets, The Bucket List, A Mighty Heart, the list is endless—but I have my favourite list of classics. Roman Holiday tops the list. I first saw the movie as a gawky teenager with my friends while in college and dived straight into love with Gregory Peck and Audrey Hepburn. Everything was perfect...the story, the locations, the actors—everything, but the ending. I would have preferred a Bollywood-style happy ending! When and how was the idea of, well, a Roman holiday born? My husband and I are travel junkies, and we’re forever planning offbeat or creative holidays. I’ve always wanted to go to Rome, but it was the zillionth viewing of Roman Holiday one cold February night in Delhi that made me sit up and say: ‘This is it. 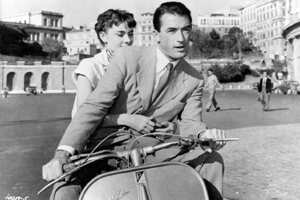 I am going to have my very own Roman holiday this summer!’ Of course, I would have loved to travel with a young Gregory Peck but, alas, I had to go with my husband! My parents graciously agreed to babysit the kids while we took off in pursuit of Joe and Anya. Did you actually do the scooter thing, as in the movie? We stayed in a really nice hotel near the Stazione Termini (central station), which was great as the metro station and the bus terminus were within walking distance, and it was easy to get hold of a scooter. It’s fascinating to discover Rome on a two-wheeler. What was it like, seeing places you’d seen any number of times on screen? I made a wish at Trevi Fountain (though I don’t remember Hepburn making one), got my hand almost bitten off at Bocca della Verità (though we smiled through most of it), romanced on the Spanish Steps, posed like one of the great statues inside the Colosseum and, of course, did the memorable scooter ride near the Piazza della Repubblica. Did you have any other agenda for Italy at all? We spent six nights in Rome and two nights in Florence and Pisa. They say even a lifetime in Rome is not enough and that’s so true. We joined a walking tour of ancient Rome, where a British guide takes you through all the history. We did most of the famous sites, addressed fictitious countrymen at the Roman forum, walked the Catacombs of Castillo and soaked in the overwhelming beauty of Michelangelo’s works at the Vatican. In fact, the Sistine Chapel rather overshadows all the other glorious artwork in the Vatican—if they’d been anywhere else in the world, crowds would have been flocking to see them. We were there for the regular papal audience as well. We were pleasantly surprised to see quite a mix of people in the crowd, including some women with head-scarves. What was the most memorable takeaway from the holiday? It was this overpowering feeling of behaving like carefree youngsters fresh out of college, discovering a place together. The feeling of going back in time was priceless. Besides, the art tours have kindled a real desire to sign up for an MA in art history. And, yes, we’d love to do another movie-inspired holiday—probably, Casablanca in Morocco. No prizes for guessing why! 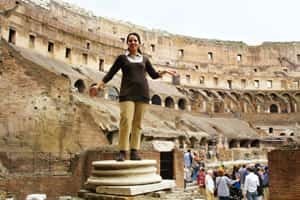 Fly to Rome with SwissAir from Mumbai (round trip for Rs35,795, including taxes), Finnair from New Delhi (round trip for Rs36,650) and Air France from Bangalore (round trip for Rs37,916).